The devil goes by many names, and his tribe is legion. Throughout human history, we have been obsessed with the dark opposites of God and angels, light, and mercy. Whether it is our religious and sacred texts, folklore, legends, and novels or the movies and television shows of today, the dark entities enthrall us, terrify us, and remind us of the duality of good and evil. Ancient cultures, virtually all religious traditions, and our modern society all have their lore, myths, and legends of monstrous, heinous, and sinister creatures populating the earth, plaguing mankind, and causing great suffering. But are they real—and where did they originate? Where are they now? DEMONS, THE DEVIL AND FALLEN ANGELS is a comprehensive, clear, and objective look at a subject that fills most people with fear and dread, one that remains a part of our human experience, our popular culture, and our spiritual understandings. It explores the shadowy side of existence and its integral part of our nature within over two dozen religious traditions, myths, folkloric and spiritual traditions, and the world of the supernatural, as well as the demons, the Devil, and fallen angels in today’s pop culture. This wide-ranging tome explores everything from ancient demon worship to modern Satanism, the bloody era of the Inquisitions and later witch burnings, the Satanic Panic of the late-twentieth century. and secret occult societies, as well as demonic places, possessed objects, and Hitler’s involvement with demonology. Learn about the link between demons/fallen angels and aliens, cryptids, apparitions, and poltergeists, as well as the cultural history of demons and the Devil, the practices behind the worship of dark forces, and the lives of well-known figures who were alleged Satanists, some of whom may surprise you! 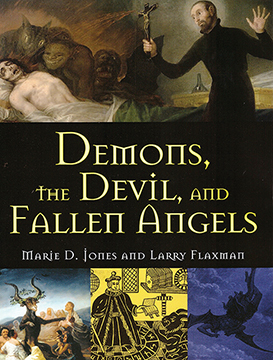 DEMONS, THE DEVIL AND FALLEN ANGELS By Marie Jones and Larry Flaxman. 384 Pages. 7x9 Paperback. Illustrated.